I'm trying something different this time. I've got a Save right at the beginning and instead of looking for wingers, I'm going to get a couple CM B2B guys to retrain as wide midfielders for wing play in a 4-4-1-1. Lorenzo Pellegrini can be had for $35m USD. Tierney for $30m USD (ish), Rugani for around $55m USD. 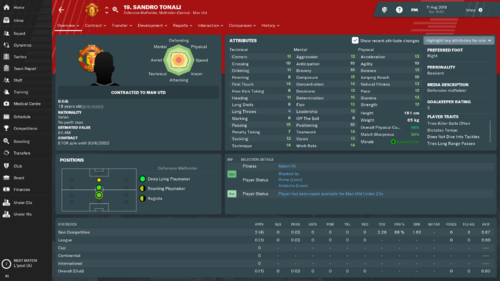 Now I just need to find that B2B midfielder with a good right foot as he'll be my crosser. He's also left footed - I need a right foot on the right. I picked up Pavon - we'll see what he turns into. My bad, didn't realise we had so many left-footed players! I think Benassi has decent crossing, but also has "Runs With Ball Rarely" - perhaps could be a knock-off Beckham wide on the right for you? 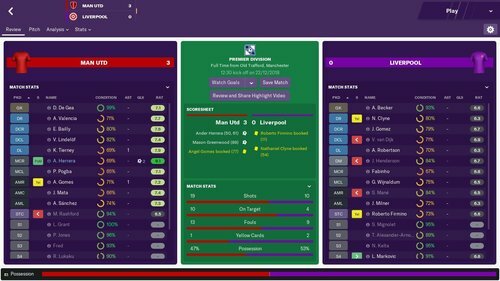 Injuries have meant that I've only one player in double figures (Lukaku on 10) despite us scoring 64 goals in 29 games, and only three outfield players reached 20 apps. 18 different goalscorers and the only outfield players who have neither scored or asisted are Evra, Jones and Rojo who are backups (the latter two also missing large chunks of the season so far with injury). Angel Gomes: 4(1) apps 2 goals, mostly as a CF-Su which he is completely unsuited to. 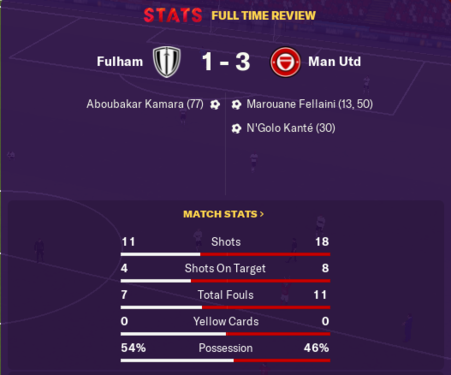 Quarter final 1st leg Champions League,crazy amount of shots at goal. Not one to post City related stuff but this result was just crazy. It's all there just set the IF's to get forward,shoot more often and cross aim centre. Is that the only PI's you have? And what about OI's? I don't do OI's.AMC has more risky passes and and DLP has more direct passing. 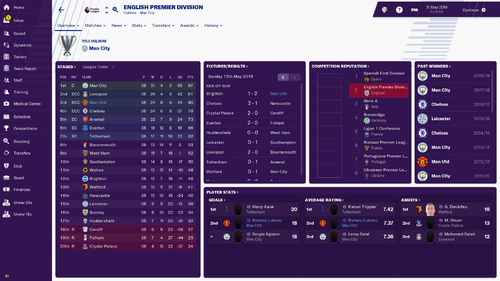 I’m currently playing the carabao cup final in the second season and I was unbeaten throughout the season in domestic competitions until the start of February when I lost 1-0 to West Ham thanks to a 92nd minute penalty. having only lost one game in the league I currently sit 3rd in the league with both Liverpool and Tottenham above me due to then winning games which I draw. What about the striker? Do you always play him as a poacher or the role that suits the player the best? I spent £93m in the summer to bring in Icardi and it proved money well spent as he finished top of the goalscorers charts in the Premiership and the Champions League. 46 goals in 50 games in all competitions. Last season PSG beat us 2-3 in the Champions League Final so the aim was to win it this time round. Icardi scores the winner in the 120th minute. 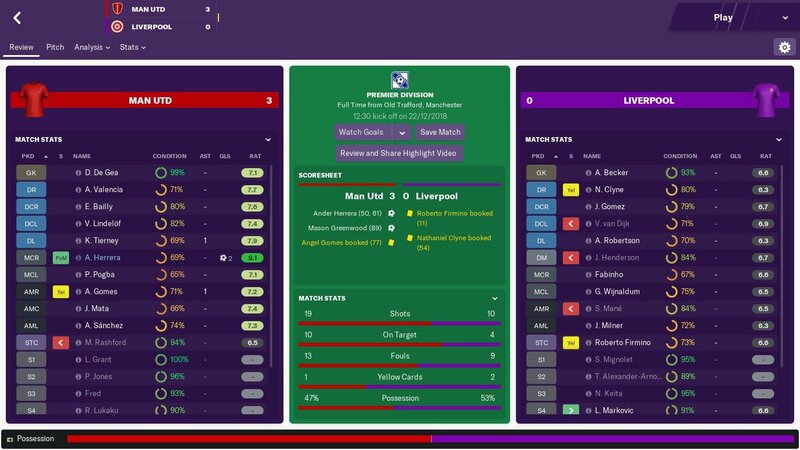 Arsenal got the better of us in both cup competitions.In the Carabao Cup Final we lost on penalties after a crazy 5-5 draw and they also beat us 1-0 in the FA Cup semi-final. 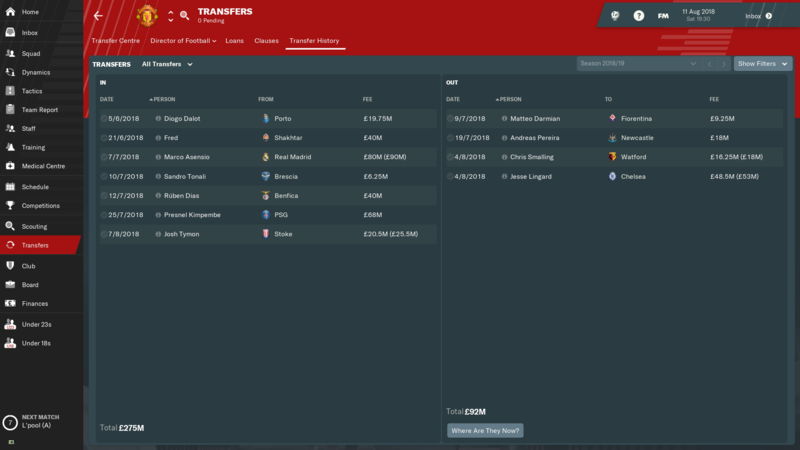 The club has £341m funds available for transfers and i'm looking at making the AMR position stronger.Top of the list would be Mbappe but he will cost upwards of £200m.If I can free up £100m in player sales I might try and get him. The goal for next season is to win everything. 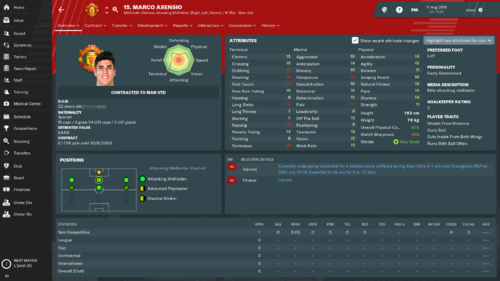 Just goalscoring roles so poacher or advanced forward. and there he is £189m later!! !Along with Lewis Cook who is A) a really good midfielder and B)English and a decent right back in Vagnoman who will provide competition for Kimmich. 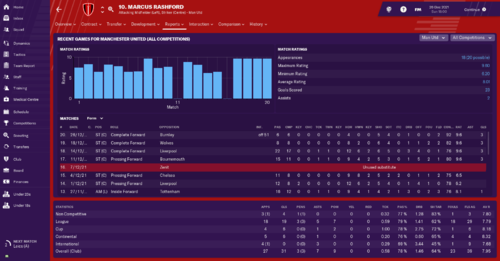 Now here comes the CRAZY.I thought if I could make £100m in player sales I'd go for Mbappe.Here's what I did. £405m later!! What have I done?? To be fair,I did finish about 25 points clear last season so i'm thinking that what I have along with my 3 new signings should still allow me to go for the lot. I may bring in one more big signing but i'm not sure, injuries is the only thing that worries me especially if I get 4 or 5. How much consideration do people put into the starting 11's condition and injury risk status?? 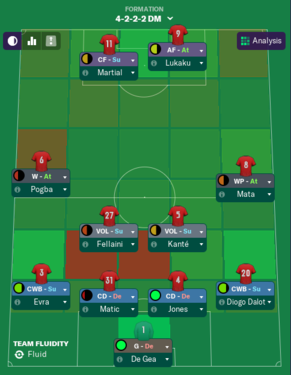 I've always rotated players when their condition is in the low 90s, unless i have little choice, and ive also just started trying to keep an eye on 'Injury Risk' and not use players on High risk. 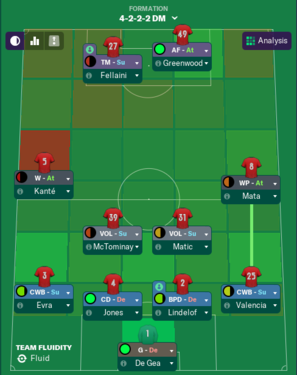 There are a handful of players who can frequently start 2 games in a week, and then theres some (eg Shaw) who i need to rotate every fixture, often subbing them around the 60-70th minute if there are injury issues. Its almost like im running 2 line-ups, a weekend-11 and a midweek-11, and anyone wanting to be in both needs to be subbed around the 60-70th minute. The reason i bring all this up is that a few matches back i noticed that the 'Team Goals' mini-table was all (3) Liverpool players. So i checked their squad, and somethings clearly different there. Right now, they've played 23 competitive fixtures. Varane has started every single game (85min/avg) and they have 12 players who's avg min/game is over 80. 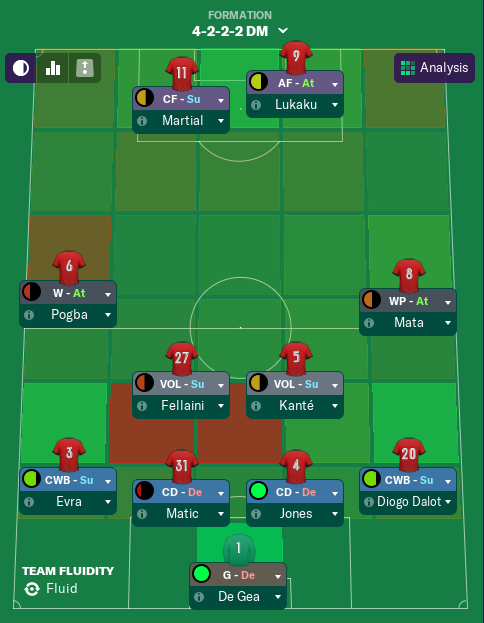 I've played 25, and only De Gea has played every game, next best is Dalot on 17. Only 4 players have an avg min/game over 80. I have my training set to my head coach, and i'd say the tactics 'intensity' is about 60%. So i dont think im burning them out, and yet i feel like when those CL games come in, and theres ALWAYS a big fixture before/after, i have to heavily compromise my selection, and the 3rd fixture will be compromised too. My issue is that clearly Liverpool dont have this problem. Its the same thing with City, Chelsea, Arsenal & Spurs. Chelsea have 3 players who've started every game. The above was a concern for me before i started putting much consideration into the 'Injury Risk' too, last season i'd give people breaks from time to time when told they look worn out, as well as regular rotation, but i dont know whether im being too soft and shouldnt be concerned with starting players who are at say 90 condition and/or 'High' risk, whether my training regime needs to be overhauled (which i really dont fancy being responsible for maintaining) or whether my tactic even at 60% intensity is considered heavy going. How does everyone else approach this, cos ive been trying to ensure im signing players with high natural fitness, but its still an issue. Im trying to claw back the points i lost early on in the season, against a side that seems to be full of terminators playing almost every minute of every game. 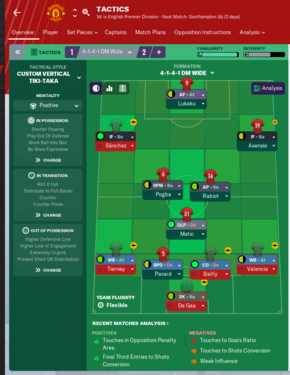 Its only Liverpool, so they'll bottle it but I dont know whether its something im doing wrong or just the AI being a little wonky. Shouldn't be anything wrong with them,I use IMGUR. Actually thinking about it I cleared up my imgur album.That's probably why they've gone. At least I have those screenshots for the roles though. 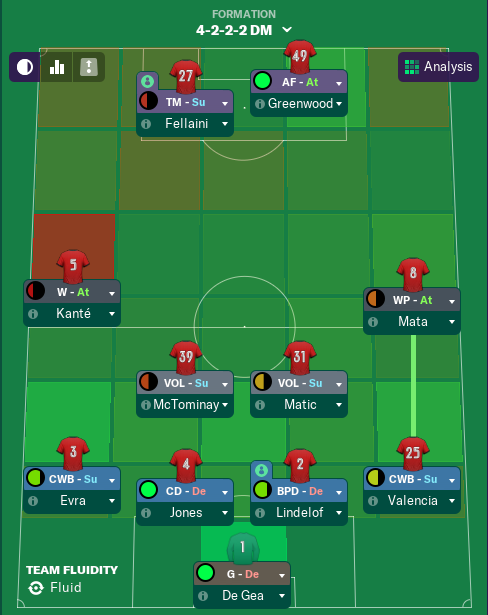 Just installed FM, how much budget is typical for United in season 2? I'm trying to work out how many of Dier, Alderwield, Son, Skirinar and Savic are realistic over the first three transfer windows. Any ideas? I'm playing with INTER, smalling left for free at the end of first season. Eric Bailly and Viktor Lindelof transfer listed in 2nd season. I have no ideo what they're thinking. 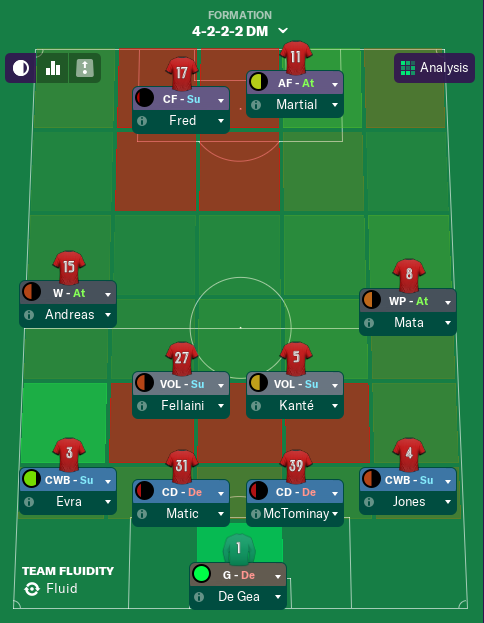 Just started my first season with United. Looking for a good Ball Winning Midfielder to play in the DM position. Any ideas? First transfer window. roberto gagliardini or marcelo brozovic. If you're okay with spending most of your transfer budget on a DM then go for Casemiro. Thanks. 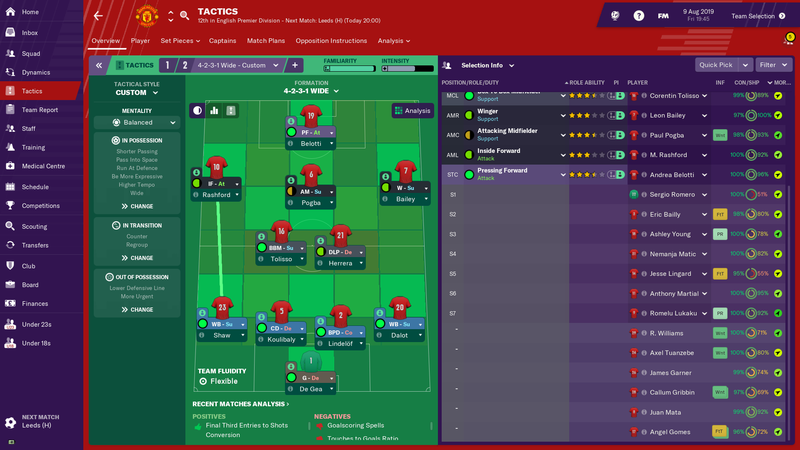 What are the typical budgets for the second season, assuming a CL finish in season one? 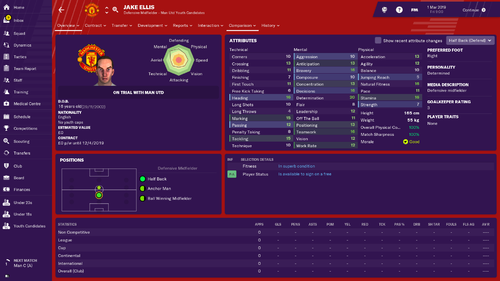 About 120M £ (I finished 3rd in PL, CL Champion, Carabao Cup Champion, FA Cup runner-up) . I got Savic for 80m in 1st offer. The game is to wing dependant isn't it so most play seems to go out wide to marauding fullbacks who cross it in for strikers to score,I have a cracking 4231 but hardly anything goes through the middle for IF'S to get on the end of.I don't think I've managed to get a wide attacker to score more than 15 goals(a season) across 4 seasons so far.Which is irritating because I bought Mbappe to play on the right but he probably wont score that many. well I had a period of getting the striker to score but the AMC was doing bugger all. Changed the AMC role and the striker became invisible. IF on the left can either pop up with a match winner or be a useful as a condom machine in the Vatican. However, my main problem is that I'm really struggling to score goals. I'm first in the premier league and have got an alright defensive record but we can barely score. In 8 games, we've only got 12 goals, with most of our goals coming through long shots, set pieces, and penalties, which is hardly sustainable. 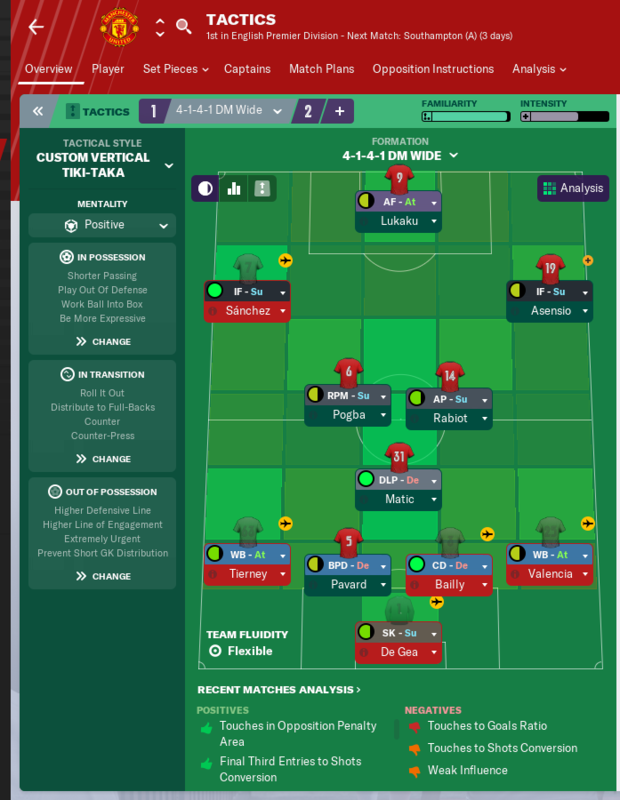 Do you guys have any advice for my 4-3-3? 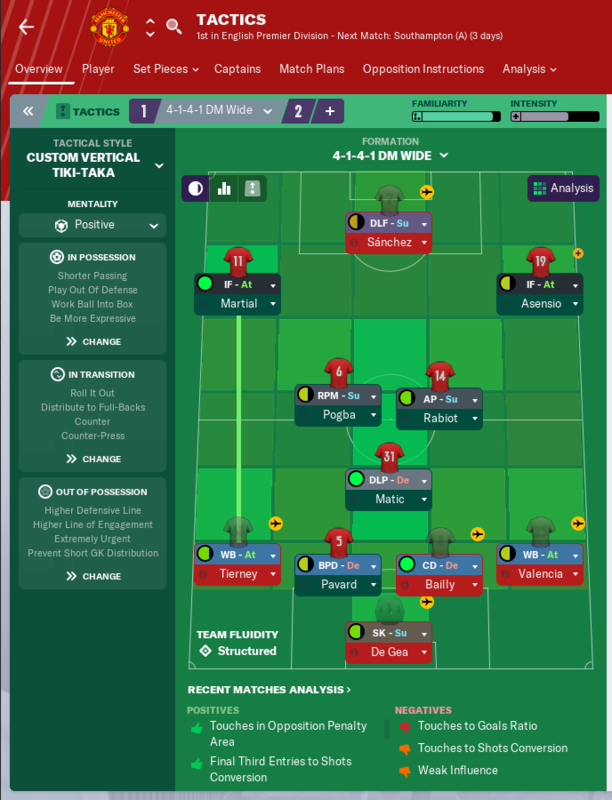 I tried the vertical tiki-taka preset, but got no results, so I made some tweaks and yet still am struggling to score. So I finally started my man utd save a few days ago. 1st thing I did was sort my staff. Next up transfers, I have big plans for the squad, there's a lot of players I want rid of. 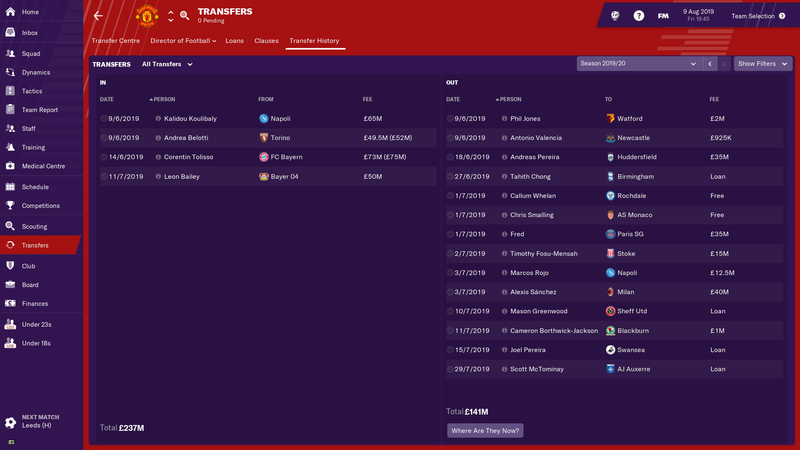 But 1st transfer window, I decided not to buy anyone, am saving it for the 2nd season once I have sold everyone I want to. The only player I sold was Darmain, tried to sell Jones but he kept rejecting teams so will just be released on a free at end of the season. So far things are going ok, but Man city have just been unbelievable and only recently just lost their 1st game. Carabao cup we lost in the 3rd round on pens to Stoke. Champs league, we got a tough group of Real madrid, Celtic and Monaco. After losing the 1st game to madrid, we ended up winning the group and got handed Dortmund in the next round. Just in January and a big offer from China has come in for Fellaini so I think that will be him out the door. I don't think I've ever seen anything like this, even during the Championship manager days ! Same, as a Manchester United fan I always do a man utd save, but this year more than any there seems more to sort with the team to make our team great again. 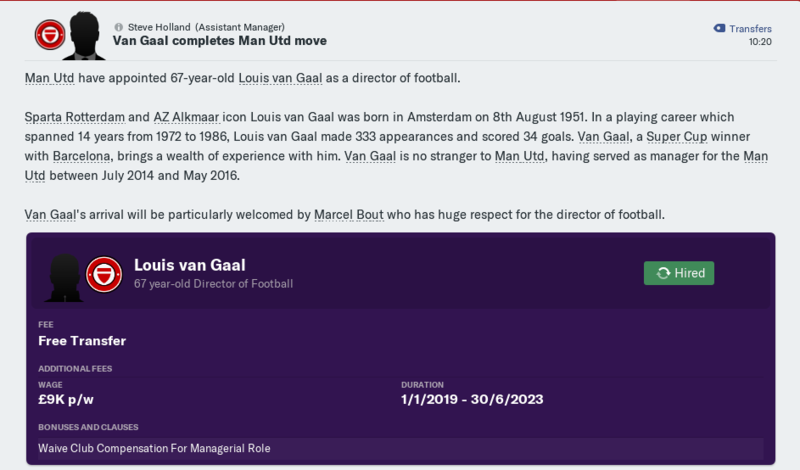 There's a lot of players who even though they perform well on fm and you can win trophies with them, they just aren't good enough or just don't fit in with what Manchester united is, so I'm looking forward to making big changes, concentrating on youth and putting man utd back on top. 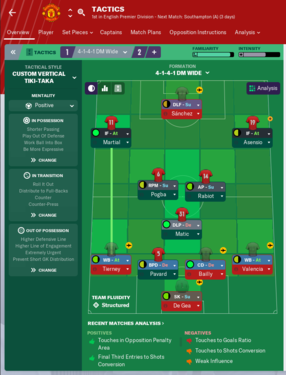 I haven't made many changes to the squad in the 1st season but once I can sell all the players I want, I will. So we got the 1st youth intake and got this player in it. Very happy with that, especially as Man utd have good youth in attack and defence, yet lack good youth players in midfield so this was perfect. Better than Matic already! Only issue is height and weight, by the time he is 18 he will be a starter and will hopefully put on a few pounds. Height you can live without with good posistioning, anticipation and decisions. That lad is a beast!! well I finished my second season with only 2 losses in the league. 1 to Wedt Ham at the end of February and 1 to Tottenham on the last day of the season to a 93rd minute header which also gave Tottenham the title. Diving in and doing a save but going to holiday the 1st season and then take over. If Mourinho gets sacked during this 1st season I will start a little earlier! Not enjoying the world cup year in Qatar.I play Burnley in the Carabao Cup semi final in a one off game?? ?Is this correct for this particular season or should I be reporting it as a bug? It’s not a bug, and I believe it’s just for that season, they get rid of the 2nd leg because of tight scheduling. That's what I was hoping(expecting),playing friendlies in November/December is kak.I just want to get this season out the way tbh. 1) Must sign and develop young players, particularly from our own U18s - Chong, Gomes, Greenwood and Garner all look top prospects. Equally, get the most out of those youngsters we have signed: Dalot, Martial, Rashford. 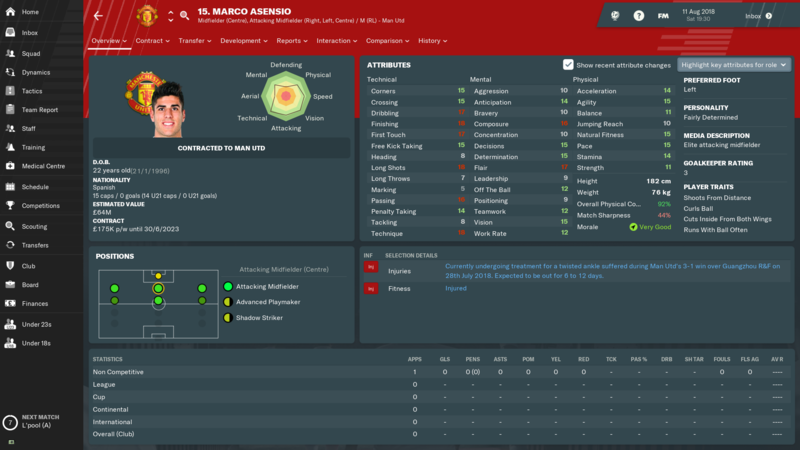 The vast majority of players I buy will be under 23, with many younger than that. 2) Sort the central defence out. 3) Have to play attacking, attractive football. Basically, the kind of football Liverpool played against us on Sunday (much as that pains me to say). Felt fairly obvious - we badly needed better CBs and I'm still hoping to shift some more of the dead wood (Rojo, Fellaini and Lindelof in particular). Asensio should provide a long-term replacement for Mata, who I really rate and will play lots. Tonali will eventually play the second CM once we develop him a bit more. I couldn't decide between Kimpembe or Dias, having had both offers accepted, and in the end went for both to rotate along with Bailly. I don't mind either extending Jones as a rotation/backup or losing him at the end of his contract, but the other three CB options are just all a bit too average for what we're targeting. Definitely overpaid for Tymon, but he was still cheaper than Tierney or Grimaldo would have been and he can sit behind Shaw for a while yet. Sales-wise, I didn't necessarily want to lose Lingard, but I don't think he's worth that money and would have eventually blocked off Gomes and Chong. The others all seemed straightforward. First game of the PL season was a 4-0 thrashing of Leicester with a Lukaku hat-trick . Hoping for more of the same to come! For the end of my second season I’ve changed to a 433 with a DLPs in the dm strata and 2 cm and it’s been working a treat. Right so the 1st season is finished, the season was ok but we didn't win any trophies. I wasn't too disappointed with this, as the 1st season has always been about just getting through until I can offload all the players I wanted to get rid of. So here's how we did. 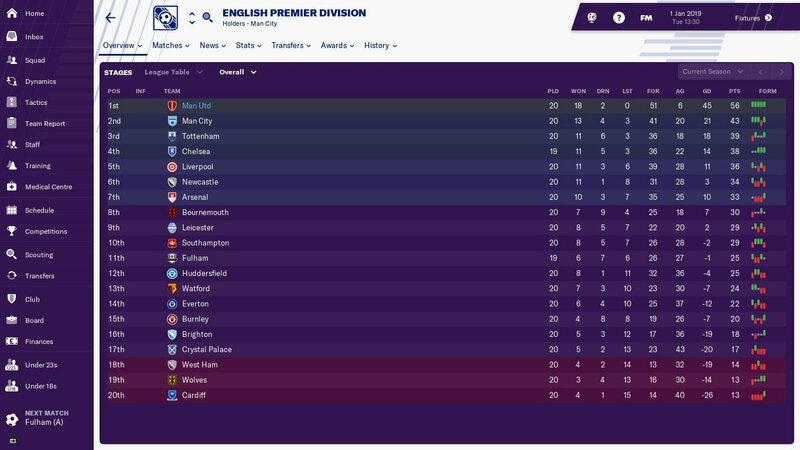 Finished 3rd in the league and as you can see Man city were pretty unstoppable, I just couldn't match them, and our form just faded away towards the end of the season, we lost a couple of silly games, losing to Newcastle and Leicester both 1-0. Champs league we lost in the quarters to Juventus, who went on to win it. 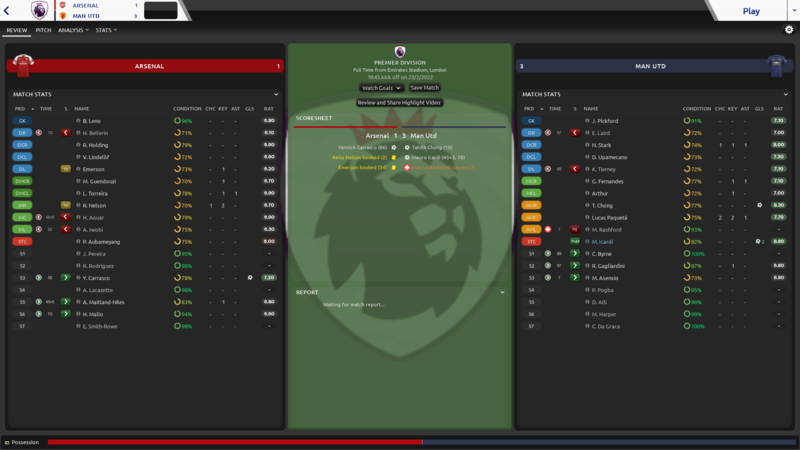 We did poorly in both domestic cups losing in the 3rd round of both. 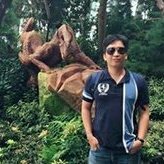 Man city won the carabao and Liverpool won the fa cup. So a poor season for us in terms of city and Liverpool winning trophies. 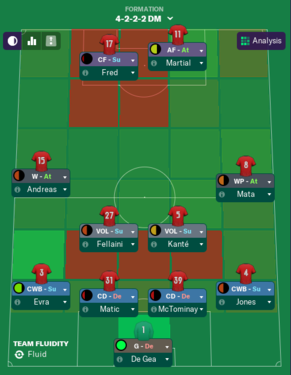 In terms of the squad, Young, Martial ad Lingard were 3 of my better players, also Lukaku did well. So now for my clear out and to make the team my own. Here's my transfers for season 2. Valencia, Jones and smalling were all out of contract but managed to get a little money. 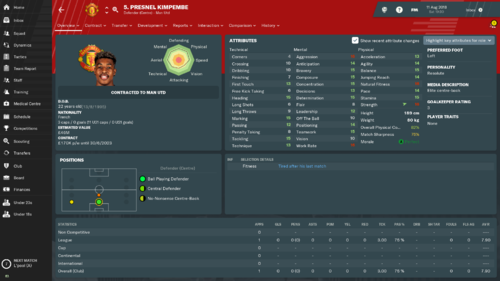 35mil for Pereira was an incredible deal, also I had to pay some of Sanchez wages to get rid of him, but wanted him gone. Transfers in, I felt the team needed a top class CB, a another CM, a proper RW and another ST , and I got all of them. I managed to get most of my business done early. I could of gone for Milinkovic Savic, but everyone signs him so didn't want him and he went to City, Tolisso is someone I had on fm18 and was brilliant so was a easy decision. 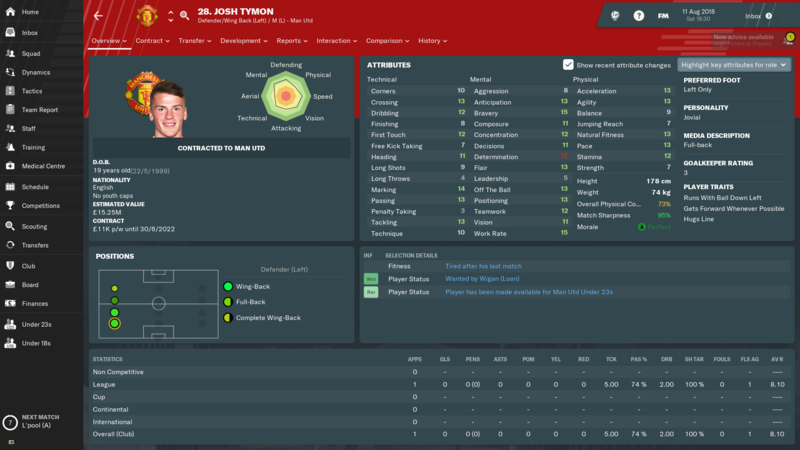 Only area I missed out on was a back up full back really, but Stoke wanted way too much for Tymon. Chong and Greenwood are 2 players I want to make 1st teamers, Chong especially as in my beta pompey save, the AI developed Chong into a beast. 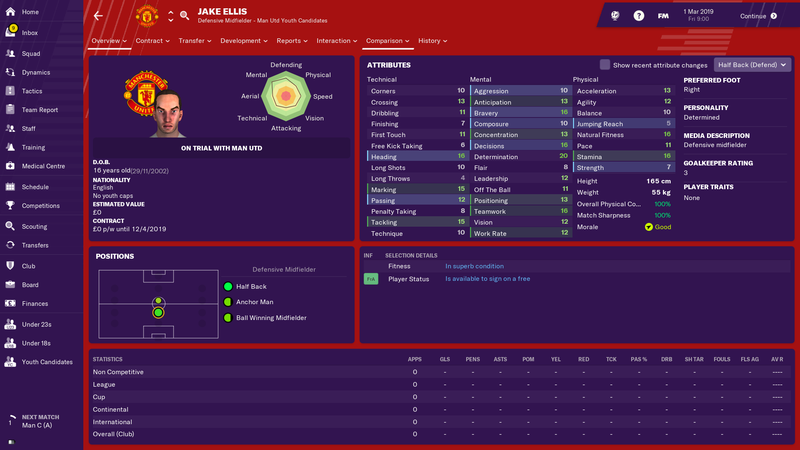 Annoyingly both their determinations went down in season 1, so they have been sent out on loan to get a full season of 1st team football. Here is how we line up for season 2. Martial and Rashford will be rotated, along with Bailey and Lingard. I've moved Pogba further forward, and am training him up in that position. 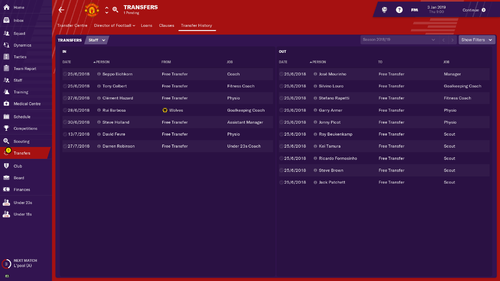 As can see I promoted a few youth players, Tuanzebe and Gomes are back off loan and have been promoted, Garner is also someone I want to develop. Gribbin and Ro Shaun Williams were in the 1st team in the 1st season so carry on their development. So now my save really begins and lets see what we can do.